The Viburnum 'Mohican', Viburnum lantana 'Mohican', is an incredibly tough shrub that is essentially evergreen in warmer climates. The dark, hairy leaves create a dark background to showcase other plants.It displays a very compact growth habit. 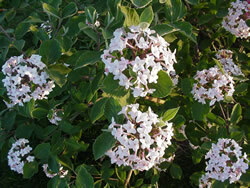 The creamy white, flat topped flowers entirely envelop the plant in late April or May, followed by orange-red fruit in early July lasting a month before turning black in fall. The Mohican makes a nice hedge with the compact shape and heavy, dark green foliage. The fall color is attractive.